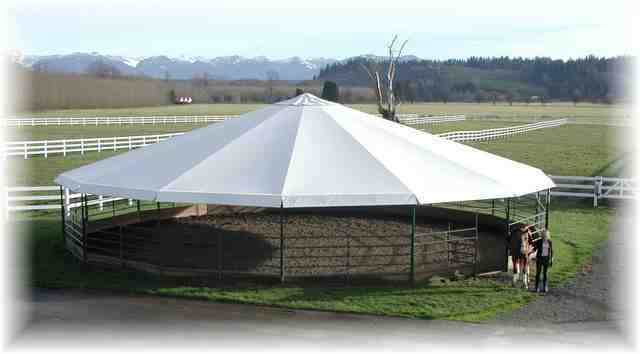 EQ-Wine Covers Co is proud to be the exclusive California dealer for this exciting new Round Pen Cover! It can be permanently installed, or installed as a portable cover. This makes it ideal for professional trainers, and those who plan on new properties in the near future. This cover shown in optional "sand"colored roofing, available at no extra cost. The frame itself is constructed of 2" schedule 40 black pipe, primed and then painted in the color of your choice. Many clients opt for custom colors to match their farm or ranch. The base frame is freestanding with an anchoring system that is cemented in your existing round pen. 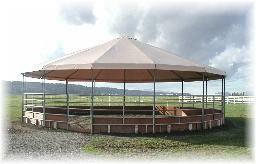 Round Pen Covers are available in many sizes, colors, fabrics, and post colors.